Citrus-floral fragrances are made for hot weather; the best of them smell light and airy, brisk and cooling (all the sensations I want from a scent on a sultry day). I like summer fragrances to smell “clean” but also possess a hint of sexiness — a “bare” quality. 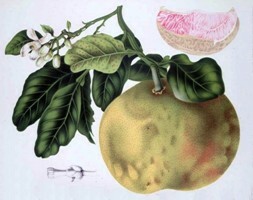 The fat and heavy pomelo (Citrus maxima), which you may have encountered in Southeast Asian cooking (think: mild, sweet grapefruit), is an excellent inspiration for such a summer perfume. Pomelo Blossom is part of D.S. & Durga's spring-summer 2010 (limited edition) fragrance collection for Anthropologie, and it contains notes of pomelo blossom, grapefruit peel and white musk. Pomelo Blossom goes on sharp and juicy (smelling like fresh oranges, a mix of cool peel and juice). In mid-development, floral notes become apparent; these floral notes remind me of slightly indolic jasmine and pungent, “wild” orange blossom. My favorite part of Pomelo Blossom is the oily grapefruit rind note; the peel, along with the floral accord, provides the “sexiness” I like in a summer fragrance. For those who hate ‘grapefruit’ in perfume, who find it harsh and outright “urinous,” you may have a problem with its use in Pomelo Blossom. On my skin, the grapefruit note does NOT smell like cat pee, but it is a tad “sweaty” (in the freshest possible way). As Pomelo Blossom dries down, all the notes (citrus juice and peel, floral) merge with a sheer, soft and slightly sweet musk note. Pomelo Blossom is more complex and substantial than an Eau de Cologne-type citrus fragrance; it has very good lasting power and sillage — without being “heavy.” My only complaint? Like so many niche scents these days, it’s a limited edition offering. If you love it, you’ll have to stock up! Though it's marketed as a "feminine" fragrance, Pomelo Blossom could easily be worn by a man — at least the type of man who enjoys citrus blossom scents. D.S. & Durga Pomelo Blossom Eau de Parfum is $58 for 50 ml and is available at select Anthropologie stores and on the Anthropologie website. Note: top image of Citrus maxima by Berthe Hoola van Nooten from Fleurs, Fruits et Feuillages Choisis de l'Ile de Java [cropped] via Wikimedia Commons. I’ll have to make an effort to check this out. I have no problems with grapefruit notes and love the scent of fresh sweat. Did you try any of the other limited-edition scents there? I remember one had a marigold note, and I love marigold. jirish: Petigrain Sur Fleur was very nice too. it’s not my absolute favorite or anything but I enjoy it. I do love musky florals. What I’m really diggin’ though is the bottle. Looks like ‘old world’ aftershave. Is that a tree on it? Tamara: I believe that’s a clump of marigolds on the bottle. I’m really glad you reviewed this Kevin. I haven’t tried any of the DS&D fragrances yet and this would be a great place to start I think. We have been having the hottest summer I can remember and I NEED a perfume like this one! Nice price too. Rustic Dove: this is a VERY nice summer fragrance…it’s cool here again…the coolest summer in Seattle EVER. Sounds delicious, Kevin, as long as I get none of the dreaded “cat pee” note. I looked for D.S. & Durga at my local Anthropologie over a month ago and they weren’t carrying any of the line yet, which irritated me (apparently the Santa Barbara store isn’t “select” enough? hrrmph). Maybe I’ll try again. Speaking of interesting citruses, I’ve finally gotten a decant of Orange Star since you reviewed it and I LOVE it; it is in no way too heavy for me. I do love a citrus floral. Keep checking! Our Anthropologie here in San Diego just got the D.S. & Durga line, within the last few weeks. Sniffed quickly as I was in a hurry and none were that exciting to me. Will have to try this one again. Joe: so strange…these being limited editions you’d think Anthropologie would be selling them in every store. Sounds really interesting – thanks for the review! I don’t normaly have troubles with citrus/grapefruit, etc. so perhaps this will be a lot of fun. Anns: it’s rare for a grapefruit note to go “bad” on me, but when they do it can be awful. Ooh — forgot about these DS & Durga summer limited editions. I’ll have to check out all three, but this sounds lovely to me based on your review, Kevin. I’m a big grapefruit fan, too. It always seems to work for me without veering into cat pee territory. 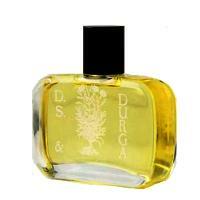 I have DS & Durga East MidEast and think it’s such a great quality fragrance, especially for the price. I’ve really been hoping they’d come up with another winner, and this sounds promising! tsetse: I really enjoy this one and the Petigrain…also, DS & Durga will be adding to their own line this fall with new fragrances. Oh, you ARE an evil man…yes indeed. Daisy: don’t know what to say! HA! I’d tell you to go search it out, but it may be sold out by then! So, move on, my child…move on..I’ll have others to tempt you with next week…. Thanks, Kevin! I love the pomelo photo, and the fragrance sounds well worth trying. That Petitgrain Sur Fleur sounds really appealing, too! I had to take a peek at DS &Durga’s offerings over at Anthropologie and all of them look lovely in their own way. But I do love a good grapefruit frag and usually don’t have trouble pulling it off (I can wear the divisive Guerlain Pamplelune fairly well) so this is especially tempting. I love neroli and amber, too, so the rest of the line looks great as well. But I’ve recently fallen for Field Notes from Paris so think that will satisfy the ongoing neroli jones for the time being. Thanks for the review, Kevin. AbScent: Field Notes is on my HUGE ‘to buy’ list as well. I love this one, D.S. and Durga seem to know exactly the right ways to use grapefruit, I love the original ‘grapefruit’ from their own line. And the new bottles are even better in person! Irish: I didn’t even know about the “original” grapefruit. It’s from the Feminine II collection, I actually like it better than Pomelo Blossom. Would be happy to make you a sample from my bottle if you would like.